This is a book plate for an art study. 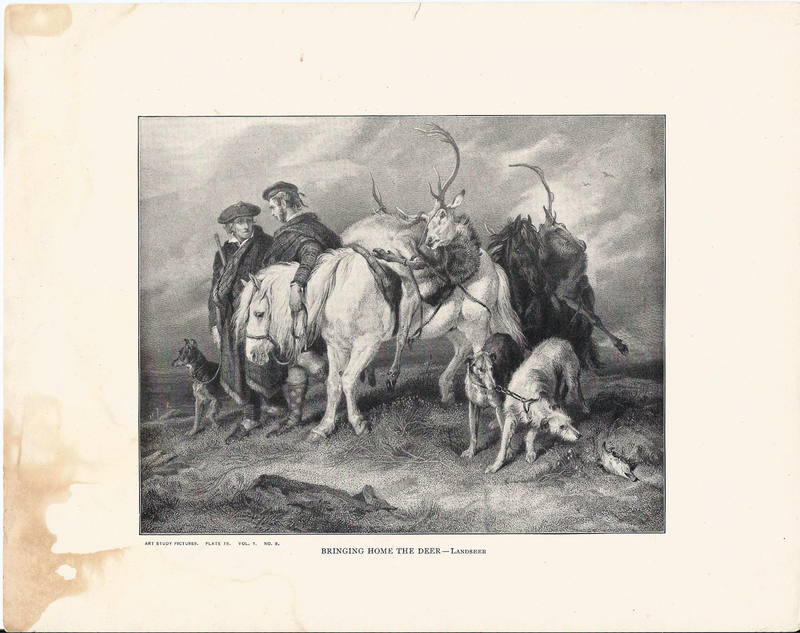 Sir Edward Landseer was the original artist. It's difficult to tell what this print is but it appears to be a lithograph of the oringinal engraving. The left side of the margin is stained but the art image is fine. It will frame up nicely and is a delightful image for the collector. I purchased this in the mid 70's at a book fair were only book plates or pages were being sold. I have no other information on this one. The Title below the print reads "Art Study Picture, Plate 78 VoL 1 No. 8 "BRINGING HOME THE DEER - LANDSEER". Image size is about 5"x8".